A good material for food industry conveyor belts is Thermoplastic Polyurethane (TPU). TPU can be extremely useful for high-performance applications as it provides essential properties that many other types of similar polymers do not possess. Although TPU conveyor belts are classified into different categories based on their nature, their general features include high resistance to wear and abrasion and high resistance to vegetable, animal, and mineral oils and fats. These key factors make TPU Conveyor belts ideal for food industry use with highly demanding applications such as in the confectionary industry, requiring adaptability to temperature changes, superior abrasion, and easy-to-clean surfaces. There are also different TPU options available based on needs such as belts with better resistance to hydrolysis and improved flexibility at lower temperature or belts with higher resistance to thermal oxidation. TPU belts offer smooth surfaces to reduce bacterial deposits and ease the belt cleaning process. 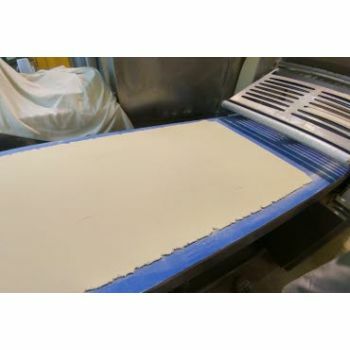 Although the material is relatively expensive for TPU conveyor belts, it is highly suitable for a range of modern food processes that have special requirements for direct food to belt contact.